Wahama senior Demitrius Serevicz, middle, is swarmed by teammates as he touches home plate following a two-run homer in the top of the seventh inning Friday night against Bishop Donahue in a Class A state semifinal baseball game at Appalachian Power Park in Charleston, W.Va.
CHARLESTON, W.Va. — The prize is within reach. All that’s left is to take it. Wahama broke a three-all tie with three runs in the top of the seventh, then the guests made that lead stick while advancing to the state baseball championship game following a 6-3 victory over Bishop Donahue in a Class A semifinal Friday night at Appalachian Power Park in Kanawha County. The White Falcons (24-7) fell behind 2-0 through two complete, but the Red and White responded with three scores in the fourth to claim a narrow one-run cushion. The Bishops (21-6) answered with a run in the fifth to knot things up at three, which ultimately set up one climactic finish. The White Falcons broke through in the top of the seventh after Kaileb Sheets led things off with a ground-rule double, then Philip Hoffman provided a sacrifice bunt to advance Sheets to third with one out. Garrett Miller delivered a single to left-center that allowed Sheets to score the eventual game-winning run for a 4-3 edge, then Demitrius Serevicz unloaded a 400-plus-foot bomb to right center that cleared the fences —allowing the Red and White to secure a three-run lead headed into the final half-inning. Hoffman — who fanned nine through six innings on the mound — ran into trouble in the home half of the seventh as Bret Moore and Andrew Cunningham reeled off back-to-back one-out singles, then Matt Vucelik walked with two away to load the bases. Alex Riedel stepped to the plate as the potential game-winning run, but eventually flew out to WHS centerfielder Jared Nutter — leaving the bases loaded as Wahama advanced to the Class A final for the first time in 17 years. The White Falcons — who came away with the 1996 and 1998 Class A titles in baseball — have now won five straight Final Four state tournament games and will face either Man or Moorefield at approximately 4 p.m. Saturday at Power Park. Afterwards, WHS coach Tom Cullen spoke about his troops collectively coming through when they needed to. The 10th-year mentor also noted that seeing Miller and Serevicz — a pair of seniors — come through in the clutch made the day that much extra special. “At first, I was just happy to get here. That’s a lie, because we wanted to do as well as we could when we got here,” Cullen said. “I told the kids that as long as they played hard, I’d be happy with that. Although Miller technically provided the game-winner, it was Serevicz’s blast that provided enough breathing room for the guests to relax headed into the bottom of the seventh. After battling back from a meniscus tear that occurred during wrestling season, Serevicz was in awe of his personal feat. But, as he put it, the hard worked paid off and his guys have another chance to do again in less than 24 hours. Wahama had opportunities early on, but ultimately stranded a runner on base in each of the first three frames. The White Falcons produced five baserunners during that span, but only one made it to second base. Hoffman retired the side on strikeouts in the first, but quickly found himself in a pickle in the bottom of the second. Riedel doubled to start the frame, then Logan Wells produced an infield hit that allowed BDHS to put runners on the corners with nobody out. Wells slid in under the tag at second on a steal to put a pair in scoring position, then Hoffman uncorked a wild pitch that allowed Riedel to score and sent Wells to third. Wells later scored on a groundout by John Stocklask to give the hosts a 2-0 cushion through two complete. Wahama finally broke through in the top of the fourth as Miller led the frame off with a walk, then Serevicz received a one-out walk to put a pair on base. Both Miller and Serevicz advanced up a base on steals, then Jared Oliver grounded out and allowed Miller to score for a 2-1 deficit. Serevicz later scored on an RBI-single by Ryan Thomas to knot things up, then Thomas came homeward on a single to right by Ricky Kearns for a WHS 3-2 advantage. Wahama dodged a bullet in the fourth after Hoffman walked a pair, but then he recorded the finals two outs with Ks — allowing the guests to maintain that one-run cushion. The Bishops, however, tied the game in the fifth after a one-out walk to Andrew Cunningham led to a run on a two-out RBI single to left by Matt Vucelik — making it a three-all contest through five complete. The White Falcons outhit the hosts by an 8-5 overall margin, while Bishop Donahue committed the only error in the contest. The guests stranded eight runners on base, while BDHS left seven on the bags. Hoffman was the winning pitcher of record after allowing three earned runs, five hits and five walks over seven innings while striking out nine. Jesse Padlow took the loss after surrendering six earned runs, eight hits and five walks over 6.2 frames while fanning eight. Oliver led the victors with two hits, followed by Kearns, Sheets, Miller, Serevicz, Thomas and Jared Nutter added a safety apiece. Serevicz led the White Falcons with two RBIs, while Miller and Serevicz each scored twice. Cunningham, Riedel, Wells, Vucelik and Moore had a hit each for the Bishops. Wahama has only once gone without a state tournament win during its six trips to the Final Four, which occurred during the very first appearance in 1969. The White Falcons lost to Tygarts Valley in the 1978 final and fell to Van in the 1988 championship, but also defeated Van in 1996 and Moorefield in 1998 for the program’s only two crowns. Bishop Donahue, conversely, has only appeared once in a state final — which ended in a 5-2 loss to Van in the 1992 Class A title game. Not to sound like a broken record, but Cullen was quick to note after the game that his White Falcons have a spot in the final. That, more than anything, gives them a chance to win it all. 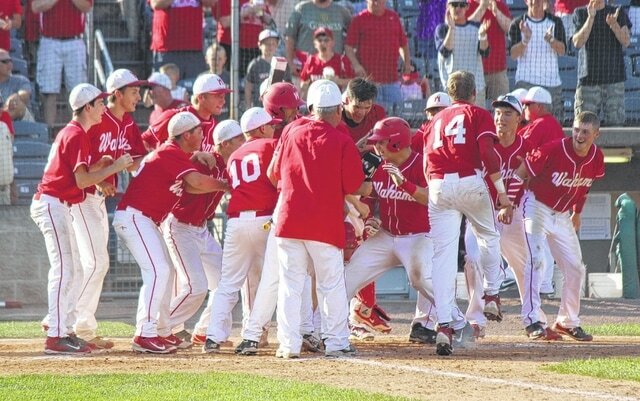 Wahama will play Man at approximately 4 p.m. Saturday for the 2015 Class A baseball championship. The defending champion Hillbillies posted a 5-1 decision over Moorefield in the second Class A semifinal Friday evening.